Local 29 has the opportunity to really help Spokane have the most articulate, most hardworking, most intelligent and ethical mayor the city has seen in recent memory. Mary Verner continually tries to do what's best for our citizens, and 99 and 44/100th percent of the time it coincides with what's best for us. You could be a vital part of Spokane history simply by helping just a little to get Mary elected. Write a letter to the editor. Doorbell. Wave signs. Talk to your friends and neighbors. You know how Mary went to bat for our citizens with the AMR overbilling. She was not a very popular person with the Hession administration for doing so, but her work proved what we were saying all along. There are many other examples of Mary standing up for what's right in Spokane and standing up for us. If you don't know these stories, talk to Greg, Rochelle or Don Waller. You have a chance to help a really good person, so she can do a really good job as our mayor. We owe it to Mary, ourselves and our citizens. There are some special events planned in the near future. Some sound like a lot of fun. Please call Rochelle at 999-2525 or Don at 991-6959. I can't tell you on the blog what these events are because it is read by people who are working for the Hession campaign. OK HERE IT IS! WHAT YOU'VE BEEN ASKING FOR!! The phone hasn't stopped ringing. "When can I listen to the KPBX mayoral debates?" "Will they rebroadcast them?" Unfortunately, the debates took place during this Tuesday's union meeting. So the throngs at the meeting were not able to listen or attend. THIS JUST IN!!!! - You can listen to the debates on KPBX on these dates! Monday Oct 22nd - 10 am and 7 pm. Wednesday Oct 24th - 10 am and 7 pm. AND AS IF THAT ISN'T ENOUGH!!!!!! HOW ABOUT THIS? Tuesday Oct 23rd - 10 am and 7 pm. Thursday Oct 25th - 10 am and 7 pm. NARRATIVE: On 10/10/07 at 3:15 A.M. members of the Spokane Fire Department responded to a report of a house fire located at 1907 W. Sharp. First companies to arrive found a wood frame house with a large amount of smoke coming from the roof area. Crews began to attack the fire from the inside while other fire crews were on the roof cutting holes to effectively "ventilate" the dwelling. It was soon learned that all 6 occupants had made their escape safely from the house. Firefighters on the inside were relieved after the roof holes were started as this lifted the smoke and heat which provided better visibility and a quicker route to the main body of the fire. At this point however, the fire had extended itself throughout the attic space and had gained a foothold near the eaves on the east side of the house. After 20 minutes the fire was contained. This fire was caused by an electrical malfunction discovered in wiring on the main level. Two passersby noticed the fire and immediately began to knock on the door to alert the occupants inside. At the same time, smoke detectors had activated. Crews remained on the scene until 5:30 A.M. extinguishing hot spots and ensuring that no smoldering material remained. The Red Cross arrived and assisted the occupants with lodging. A total of 22 firefighters on 3 engine companies, 2 ladder companies, a rescue unit and 2 battalion chiefs fought this blaze. There were no injuries to firefighters or civilians. It was pointed out to the family that they did an excellent job in making sure their smoke detectors were in "working order" and that this likely also contributed to their safe exit from the home. DAMAGE EXTENT: Extensive heat damage to the attic. Extensive smoke and water damage to the main floor. Moderate heat damage to the main floor. NARRATIVE: On 10/10/07 at 5:33 A.M. members of the Spokane Fire Department responded to a report of a garage on fire at 2126 W. Grace. Upon arrival, fire crews found a fully involved garage that was not attached to the house but near an alley and power lines. A rapid advancement of hose lines was conducted and the fire was found to be burning not only the garage but also burning through power lines. This created an extremely hazardous situation as the power lines were energized with electricity and they had dropped on a metallic fence which created a dangerous situation for neighbors and bystanders. Fire crews immediately sealed off both ends of the alley and prohibited anyone from entering this area. A call was put in to the Avista company to respond. Firefighters had this fire contained after 15 minutes but the long process of mop up and overhaul would carry on for a longer period of time. A tenant who lives in the adjacent house was using the garage for a work space and had been using candles to help illuminate the area inside in order for her to do her work. The candles had been placed in a combustible plastic holder and then she had returned to the home to retire for the evening, forgetting that the candles were still burning. 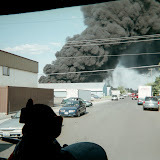 The Spokane Fire Department would like to remind citizens that if you must use candles, keep them in sturdy holders that are non-combustible and keep a clearance of at least 3 feet from anything that can burn. Never use candles in bedrooms, people fall asleep and fires happen. And finally, never use them in rooms that are unattended by an adult. Luckily, nobody was injured in this fire. A total of 22 firefighters on 4 engine companies, 1 ladder company, a pumper ladder company, a rescue unit and 2 battalion chiefs fought this blaze. PROBABLE CAUSE: Candles left unattended. DAMAGE EXTENT: The garage and contents were a total loss.